Rama is the in-dweller in every body. He is the Source of Bliss (Atma-Rama), the Rama in every individual. His blessings, upsurging from that inner spring, can confer peace and bliss. 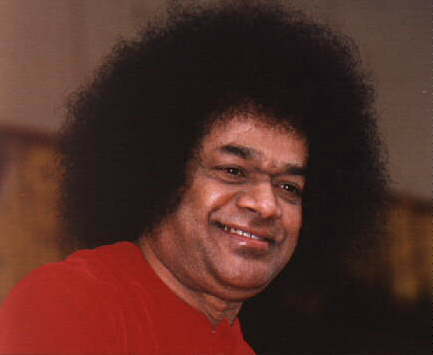 He is the very embodiment of dharma, of all the codes of morality that hold mankind together in love and unity. The Ramaayana, the Rama story, teaches two lessons: the value of detachment and the need to become aware of the Divine in every being. Faith in God and detachment from objective pursuits are the keys for human liberation. Give up sense objects, and you gain Rama. Seethaa gave up the luxuries of Ayodhya so she could be with Rama during His exile. When she cast longing eyes on the golden deer and craved it, she lost Rama's presence. Renunciation leads to joy; attachment brings about grief. Be in the world, but not of it. Rama's brothers, comrades, companions, and collaborators are all examples of people saturated with dharma. Dasaratha is the representative of the merely physical, with the ten senses. The three qualities (gunas) --serenity, passion, sloth (sathwa, rajas, thamas)-- are the three Queens. The four goals of life (purusharthas) are the four sons. Lakshmana is the intellect; Sugriva is discrimination (viveka). Vali is despair. Hanuman is the embodiment of courage. The bridge is built over the ocean of delusion. The three demon (rakshasa) chiefs Ravana, Kumbhakarna, and Vibhishana are personifications of the passionate, slothful, and serene (raajasic,thaamasic, and sathwic) qualities. Seethaa is the awareness of the Universal Absolute (Brahmajnana), which the individual must acquire and regain while undergoing travails in the crucible of life. Make your heart pure and strong, contemplating the grandeur of the Ramaayana. Be established in the faith that Rama is the reality of your existence. The entire Ramaayana is like a game of chess. The scene, in the Ramayana, is a kind of battlefield, where the forces of right and wrong are waging war. Rama represents righteousness and Ravana represents unrighteousness. The battle between the two is the war fought on the battlefield. Ravana taught a great lesson to the world. He exclaimed: "Oh men! Do not live as I have lived and ruin your lives." What is the root cause of Ravana's ruin? Unable to conquer his desires, unwilling to get rid of his impulses, he ruined his entire clan. His sons were killed, his brother and other kinsmen were killed, and ultimately his country itself was reduced to ashes. Ravana confessed, "In the end I ruined myself." This was Ravana's message to his countrymen in his last moments. Only by suppressing desires does a man manifest his humanness. A man who is unable to put an end to his desires puts an end to himself. By his good conduct, a good man achieves greatness. Ravana sought to achieve greatness but did not strive to lead a good life. This day, the birth of Sri Rama is celebrated in all lands. Rama had deed, word and thought, body, speech and mind, ever pure and totally free from blemish. Really speaking, one ought to revere the story of Rama as a profound allegory. Every act and actor in that story attracts attention and gets imprinted on the memory because the allegory is personal to each of us. It is often said that Rama followed dharma at all times. This is not the correct way of describing him. He did not follow dharma, he was dharma. What he thought, spoke, and did was dharma and is dharma forever. Devotees should install Rama in their hearts and celebrate Ramanavami in order to achieve Atmic bliss. Going through the Ramayana epic, they should reach the state of oneness with the universal spirit (Atma Rama). In such a state, there is no ego sense (ahamkara). From time immemorial, every individual in Bharat (India) has regarded Sri Rama's life as an ideal and has sought to sanctify every moment of his life by living up to it. 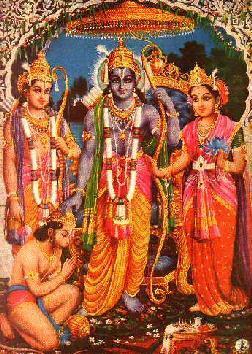 Sri Rama incarnated as a human being to promote peace and happiness in the world. "Rama is the very embodiment of righteousness (Ramo Vigrahavaan Dharmah)." It was as if righteousness itself had incarnated on earth. Dharma and Rama are inseparable. The word Rama has the triple power of destroying sins, conferring peace, and dispelling ignorance. When you utter the word "Ram", you first open the mouth with the sound Ra. All your sins go out when your mouth is open. When you utter M by closing the mouth, the entry is barred against the sins that have gone out. Everyone should recognize the sweetness, sacredness, and divinity enshrined in the name Rama. It is good to utter the name Rama with full understanding of all that it signifies. But even without that understanding the chanting of the name has the power to destroy all sins. We must learn to chant the sweet name of Rama with a pure, unsullied heart, in a spirit of selfless devotion. Men should learn to speak sweetly and pleasingly. Sweet speech confers peace. It is the means to self-realization. Sri Rama loves to dwell in the heart of the man who speaks sweetly. Wholehearted chanting of the name of Rama even once can destroy mountains of sins. But the chanting should not be done mechanically, like a gramophone record. It should emanate from the depths of the heart. 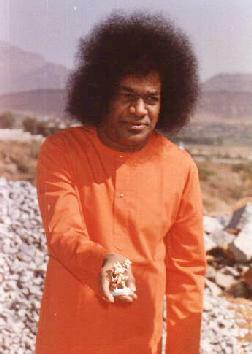 You must seek to redeem your lives, by living up to Rama's ideals and proclaiming them to the world. Remember the name of Rama with love. God can be realized only through love and by no other means.